A recent newlywed, Gemma and her husband have been busy renovating their new home on a strict budget. Her ingenuity has created the most awe-in.spiring transformations. Her work has not gone unnoticed, she has been featured on Apartment Therapy and Design Sponge! Gemma is also an avid artist, she even has her own Etsy shop where she sells colourful watercolours! 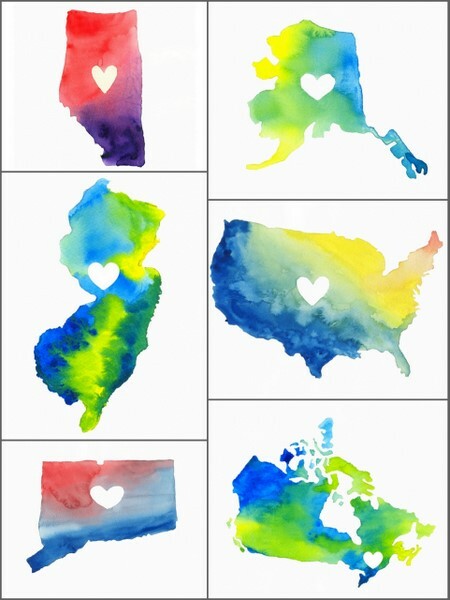 I would LOVE one for my walls! Even their wedding was a DIY affair!! Living room makeover and fabulous coffee table. And the $200 kitchen makeover. You won't believe the before! Tell us a bit about yourself? What is you background? Where to start? I’m an Ottawa native who has lived abroad in the UK, New Zealand and Nepal. I am passionate about maternal health and international development, and my “nine to five” job is as a public health project coordinator. However, I’m also super-passionate about all things interior design. I have been a keen crafter ever since I can remember. When I got a bit older and had my own space to decorate, I got totally hooked on interiors (and have been ever since). My first decorating attempt was painting my teenage bedroom yellow with a sponging technique. Oh man does it ever make me cringe to think about that now. I love all things design and DIY. I absolutely believe that everyone can make their home a place they love on a small budget. When my hubby and I bought our first house in 2009 I started branching out from my usual shelter magazines and began reading design blogs. I was instantly hooked. I loved all of the creativity, new ideas, and the personality of the bloggers shining through. Once we started renovating and decorating our own home, I figured I would try out this whole blogging thing – if anything just to keep my family and friends in the loop about what we were up to. Little did I know I would enjoy it so much and would still be blogging almost 2 years later. I hope to continue blogging for a long time to come. I think I surprised myself by really liking the writing part of blogging. I do a fair bit of academic writing, but this was totally new. I could be quirky, not worry about my crazy run-on sentences, and just have fun. I also really like that blogging keeps me motivated to try new projects. I love being creative, so it’s a great outlet for that. What has surprised me about blogging? Well, I didn’t actually think I would make any “blog friends”. Not because I’m not a social gal, but I just hadn’t considered the community aspect of blogging. There are so many other amazing folks out there in the blog world, so it’s been such a pleasure getting to know them. I hope to collaborate more with other bloggers in the near future! Where do you go for inspiration for your blog and for your home? Well I have been gathering inspiration for years and years from shelter magazines. My mum and I split the subscriptions so I get a few magazines and she gets a different few, and then we swap every month. And of course, I get tons of inspiration from other bloggers. My “bookmarks” list on my computer is crazy long and I love spending an early Sunday morning with my cuppa tea catching up on the blogs. I also get loads of inspiration from travel. I love visiting new places, seeing new things, and bringing home ideas and pieces from where I’ve been. Some of my favourite finds in my own home have been things I picked up along the way -- from artwork in South East Asia, to a tea set from Morocco, to fabric from England -- all treasures. I’m not sure I can describe my style in a couple of words – it seems to be always evolving and I really appreciate different aesthetics in different spaces. For example I love a classic kitchen with white shaker cabinets, marble backsplash and dark wood floors, but then turn around and fall in love with a room full of bright hits of pink and orange and a Moroccan vibe. I guess my style would be contemporary with a dash of flea market vintage. One thing I always tend to do in a space is mix and match old and new. If I’ve got a new sofa and rug in a living room, I’ll mix in a flea market cabinet and a rustic coffee table to make sure there is some juxtaposition in the space. Is there any one accomplishment that you are proud of ? In terms of our own home, even though it wasn’t pretty at times, I think I’m most proud of our basement renovation. 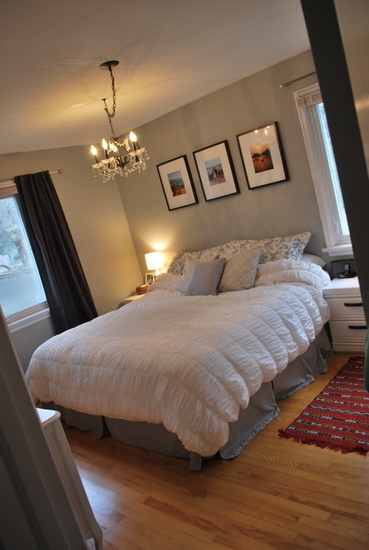 We took a really yucky, moldy space, completely gutted it, and turned it into a lovely one-bedroom apartment. We drilled into our foundation to enlarge the windows, put a sweet kitchen into what was the furnace room, and totally overhauled the space. And other than hiring an electrician and dry waller, we did it all by ourselves. By having income from our tenant, it means that we can afford a house in a super trendy neighbourhood in Ottawa, which we adore. You are a newlywed and revamping your new home on a meager budget, what are some tips you would have for others in the same situation? I absolutely believe that you do not need to have a pile of money to make your home look great. With a little bit of work and creativity, you can show your home some serious love on a budget. Get some used furniture and paint or reupholster it instead of buying all new stuff. Make curtains for your place with discount fabric (and use iron-on hemming tape if you don’t own a sewing machine!). Paint some stripes or other pattern on your walls for a pop of fun. Once you have saved up some money, spend it on those high-impact things that really make a difference – like new flooring or a nice sofa. Things that will stand the test of time and won’t go out of style. I don't think there are any hard and fast rules, just do what you love and makes you happy. If you were given the opportunity to meet anyone or do anything, who or what would it be and why? What a question. Do anything? I’m a total travel junkie, so I would have to say being able to work in a job that allowed me to take long periods of time off to travel the world would be amazing. South Africa, Guatemala, Indonesia, India, Greece, oh so many places to explore! And meet anyone? Well, I wouldn’t complain if Ryan Gosling wanted to take me on some fabulous date, say in Italy somewhere (just don’t tell my hubby!). Since I work in a completely different field during the workday, a lot of my free time is spent DIYing/decorating/thrifting/crafting and then blogging about it. When I’m not doing that, I play volleyball and dodgeball (dip, dive, duck, dodge! ), love to spend an afternoon watercolour painting (I actually just started an etsy shop: http://www.etsy.com/shop/audreyandgem), and try to get outside as much as possible. Oh and between my hubby and I, we have 16 nieces and nephews (and 1 more on the way), so we try to spend a lot of time with all of those kiddos too! I love the Canadian aesthetic. I think because of our vast landscape and beautiful scenery, we tend to bring the outdoors in and inject a lot of natural elements into our design. I find Canadian spaces to be less fussy and just at-ease. Because of our cold and long winters, I also really appreciate the cozy vibe of many designs -- layered textures, rich wood tones, Hudson bay blankets, etc. I think Canadian designers and bloggers have a lot to show off, so look out! Thanks for the interview, Barbara. It was a pleasure to be over here at hodge:podge. Keep up the lovely work! I am so thrilled you emailed me because now I have another favourite blog to read. You are an inspiration to all of us who have limited budgets, you are proof that you don't need a lot of cash to make a splash! what a sweet gal...great interview as always...and now a new blog to read! Thanks for the feature, Barbara! I feel so honoured!! Great interview and post! Love meeting her through you! Thanks. Hope you had a great vacation! did you see I tagged you in our post? Hope have a great week! Gemma is lovely! Because I have only just met her (and her blog) it was so great to read more about her. Another fantastic interview, Barbara! I am not surprised that you love a blog where they have done the kitchen floor in black & white stripes! ;) But seriously, her home looks AMAZING! And that chevron ombre art, I'll take one of those! Going to go and check out her blog for the first time now!! Thanks Barbara! I remember seeing that ceiling and being completely in awe! I"ll have to go check out her blog for more great ideas. Thanks for introducing us to Gemma! Nic eot meet you, Gemma - your kitchen makeover is impressive! Really well done. Gemma's shop is great! I think I need to do a little shopping. Great interview. Her ceiling is beautiful - can't even imagine how tricky it was to paint...and so perfectly too! 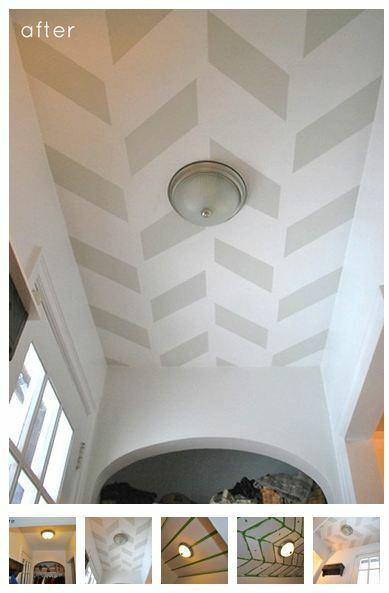 Love the chevron detail on the ceiling and that feature wall in the guest room. So fresh and inviting. Can't believe the handy couple did all the work (almost all) themselves in the basement reno!! Now I know who to call when I need to redo mine! I loved seeing what Gemma did with her kitchen. I'm helping a friend with a kitchen just like hers and it is so neat/inspiring to see that simply painting those wooden strips makes for such a huge transformation. Love the striped floor too, but that's no surprise to you, Barbara! I so loved reading about Gemma and she's from Ottawa! I'm off to check out her blog and her great DIYs.